Model 232LPTTL converts RS-232 to 5VDC TTL/CMOS compatible levels. Model 232LPTTL33 converts RS-232 to 3.3VDC TTL/CMOS compatible levels. Two channels are used to convert from RS-232 to TTL/CMOS signals and two channels are used to convert from TTL/CMOS signals to RS-232. 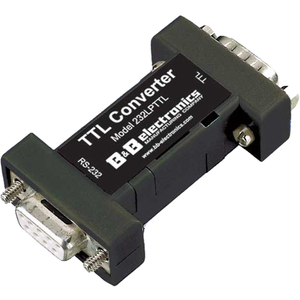 These converters support TD, RD, RTS, and CTS. DB9S female connector on the RS-232 side. DB9P male connector on the TTL/CMOS side. This unit is powered from the RS-232 data and handshake lines, whether the lines are high or low.